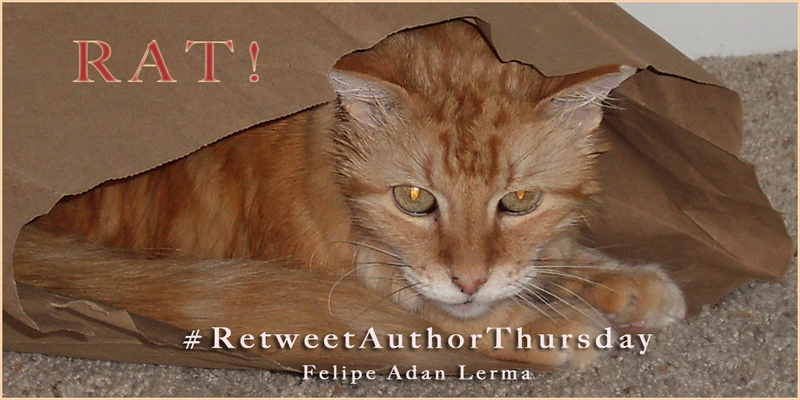 RAT Out a Writer Friend = #RetweetAuthorThursday! I’ve recently gotten back into Twitter after a few years. Either things have changed a great deal, or I was simply unaware a few years back of the full potential. Even if things have changed quite a bit, it was really Eric Lahti’s post on Twitter imaging sizes that got me going again. A few days ago I came across the best book I could hope to find, Twitter for Writers, by Rayne Hall. Her book is comprehensive yet simple and clear enough for me to “mostly” get it (smiles). And as a newly engaging writer looking to be seen and see what’s going on, I’ve looked for ways to get more followers. But of the kind that I can relate to. Folks in the arts. Folks who share content in addition to their own. A potentially good way that easily can go haywire, that Rayne does not recommend, is the kind of retweeting where one’s own followers, interested in one’s own content, are swamped with so many tweets and ads they lose interest. Or worse, run shrieking for the mute or unfollow buttons. I know. I’ve tried the swamping thing and it can be overwhelming, even to me! So I got an idea. Anyone can do their own version. My idea is, once a week, on Thursdays, I’ll retweet and tweet other writers. Heavily. To my heart’s content. Using #RetweetAuthorThursday as my hashtag. Other days I may tweet other authors, but my focus will be back on my own work. Sharing articles. Images. With no agenda other than what appeals to me. I think this is good several ways. Obviously I can share a huge variety of different genre writers’ and artists’ work. And hopefully get mine shared as well. Plus my followers, knowing it’s RAT, Retweet Author Thursday, can choose to ignore me for a while, or just peek in and see what the variety of author work being done is like. It’s not a perfect solution to the quest for discovery, like many of the ideas John Scalzi recently posted he’d like changed in Twitter, but it’s something I can try on my end. I’m posting this right away this evening, but scheduling the tweet pictured above til a quarter after twelves, CST. Another tidbit covered Rayne Lane in her book. Told you it was comprehensive. I’m still culling it. Anyway, I hope you’ll peek in on the timeline. Today, tomorrow, anytime.